When Felix Brewer skips town to avoid a prison sentence, he leaves behind a wife, Bambi, three daughters and a mistress, Julie. When the mistress disappears 10 years later, everyone assumes she went off to be with Felix. Then her body is found nearby. The police never manage to solve the murder case, but Sandy Sanchez, a former detective, decides to open the cold case about 20 years later and is determined to find the truth. 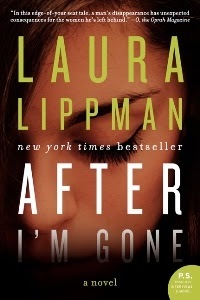 After I'm Gone by Laura Lippman is part crime novel, part family drama. Lippman covers several time frames throughout the novel, telling the story of Bambi and Felix, Julie and Felix, and Bambi and her daughters in the years after Felix's disappearance. We also get to know Sandy a bit, as well as other key characters. It sounds complicated, but it actually was easy to follow after the first few chapters. I enjoyed the different characters, particularly the three daughters who are middle aged women by the end of the novel. It was interesting to read how their father's disappearance and his affair affected them, and how they related to one another and their mother over the years. The question of what really happened to Julie remained a mystery until it was revealed, as did the question of whether Felix Brewer would ever return to his family. Overall, this was a good mystery with an engaging storyline that will keep you turning the pages until the end. Connect with Laura Lippman on her website, Facebook page or Twitter. This review was written based on a copy of After I'm Gone that I received from TLC Book Tours in exchange for an honest review. I can't believe that I live near Baltimore and still haven't read anything by Lippman. I'm certainly missing out! This was my first by her, but I will likely read another.